'Rome West' review: What if the Roman Empire discovered America? – AiPT! 'Rome West' review: What if the Roman Empire discovered America? ‘Rome West’ review: What if the Roman Empire discovered America? An exceptional alternate history of the founding of the New World. Opening with a tempest and displacing several Roman ships in the year 323, they find themselves washed ashore on the coast of New England. Well, it’s not really New England anymore. From here, the book breaks into several stories throughout America’s new timeline. We see how the Romans deal with their first encounter with the Natives, how they handle a Viking invasion and what happens when Columbus finally shows up on their doorstep. While most of the chapters involve physical conflict, the true narrative is how this Republic of Rome West evolves differently from the society we currently inhabit. It’s interesting to think how a simple moment in time could completely reshape how the New World is formed. Most importantly, the way this alternate reality is presented gives it plausibility. I really enjoy the attention to detail in the storytelling. Naturally a boat full of men would need to breed with someone, and the only women around are of the Native tribes. This plays heavily into who the settlers become, in which a blend of Roman and indigenous influences shape the settlers future. Of course things like architecture, clothing, and location names are all aspects that evolve in their own right but there are heavier consequences to this essential decision. One story in particular touches on romanticizing lineage where another deals with the inherent racism of that same lineage. In fact, racism is a central theme that weaves through the entire book and the course of this fictional history. So much is different from this timeline to our own, but bigotry seems to be the one constant. I have one gripe with the book and it mostly stems from the way it was originally released. The format is primarily four panels per page, where some or all may be split in half. This would have made for easy reading in digital format, but doesn’t lend to much creativity in its presentation for a physical paperback. This arrangement is also a bit confusing when the split panels line up. I’ve been conditioned over so many years to read left to right that going down first then back up took a bit of getting used to. Fortunately this doesn’t occur very often and is only a distraction a handful of times. Mutti’s illustrations more than make up for this setback, and each chapter is given its own prologue, allowing the shifts in time and location to be easily followed. Another nice touch is the way Popov gives each story its own color palette. While not drastically different from one another, it helps separate the stories visually and emphasizes that this isn’t one continuous adventure. 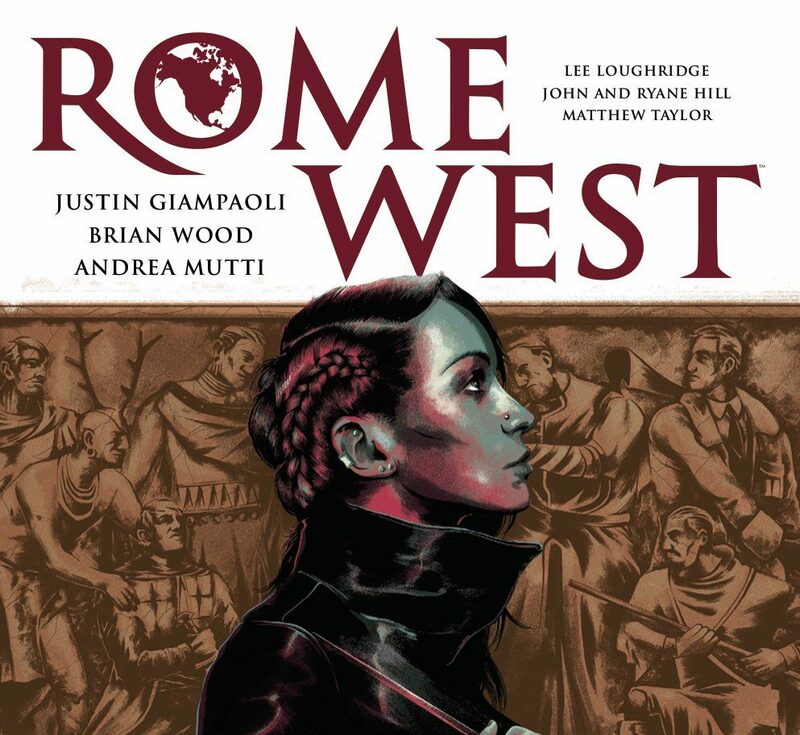 Rome West is a huge undertaking — it sacrifices the use of a central character and instead focuses on a central location to tell the story. To sum up American history in a 100 page comic book, something we are all very familiar with, would be tough enough. To create an entirely new version, and keep it engaging, interesting and comprehensible, is very impressive. Wood and Giampaoli took a gamble with Rome West, but I love everything about it. I want to see more of Concordia and understand how their religion would have changed through the melding of two very different civilizations. The idea that Native tribes would have flourished through time instead of being systematically destroyed is a story I want explored. I could easily see this being expanded upon or turned into a television series or video game. Ultimately though, even if Rome West was never touched again, it’s a story I would highly recommend to anyone. A one-off story like no other.